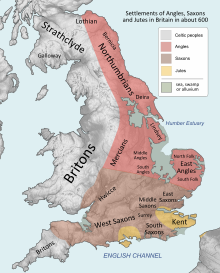 The Kingdom of Lindsey or Linnuis (Old English: Lindesege) was a lesser Anglo-Saxon kingdom, which was absorbed into Northumbria in the 7th century. Lindsey lay between the Humber estuary and the Wash, forming its inland boundaries from the courses of the Witham and Trent rivers, and the Foss Dyke between them. A marshy region south of the Humber known as the Isle of Axholme was also included. It is believed that Roman Lindum (Lincoln) was the capital of Lindsey: the continuity of the place name suggests continuity of settlement traditions: in 625, Bede recounts, the missionary Paulinus of York was received by the praefectus of Lindum. Place-name evidence indicates that the Anglian settlement known as Lindisfaras spread from the Humber coast. Lindsey means the 'island of Lincoln': it was surrounded by water and very wet land. Lincoln was in the south-west part of the kingdom. During the Anglo-Saxon settlement of Britain, from about 450, Lindsey was one of the lesser kingdoms. Although it has its own list of kings, at an early date it came under external influence. It was from time to time effectively part of Deira, of the Northumbrian kingdom and, particularly later, of Mercia. Lindsey lost its independence long before the arrival of the Danish settlers. The kingdom's prominence was before the historical period. By the time of the first historical records of Lindsey, it had become a subjugated polity, under the alternating control of Northumbria and Mercia. Its subjugation may have occurred around AD 500, during the period when the mythical British leader known as Arthur fought his second, third and fourth battles of twelve in 'Linnuis.' His twelfth victory held back Anglo-Saxon expansion for fifty years. All trace of Lindsey's separate status had vanished before the Viking assault in the late ninth century. Its territories were absorbed into the historical English county of Lincolnshire, the northern part of which is called Lindsey. The Anglian collection of genealogies, which was created in the last years of the reign of Offa of Mercia, gives a pedigree for Aldfrið, presumed to have been ruler of Lindsey. It traces him to the Anglo-Saxon god, Woden, likewise made ancestor of the other Anglo-Saxon dynasties, and provides Woden's ancestry for several further generations. Geot – Compare the Geats who are frequently mentioned in Beowulf's story. Winta – Compare Winteringham (the homestead of Winta's people) and Winterton, Lincolnshire (the farm/village of Winta's people). None of the individuals can be securely dated, though the name Biscop, Old English for 'bishop', suggests a time after conversion. Likewise, the practice of agnatic inheritance akin to blood tanistry in the Anglo-Saxon kingdoms means that it cannot be determined which of the listed male-line ancestors of Aldfrið actually ruled the kingdom. Finally, it is uncertain at what point between Aldfrið and Woden the pedigree ceases to be historical, since this pedigree is the sole source for all of the individuals named, except perhaps Aldfrið. With regard to Aldfrið, Frank Stenton referred to the witness list for an Anglo-Saxon charter which includes an "Ealfrid rex", and dated its writing to some time between the years 787 and 796. Scholars now believe that the name on the witness list should read "Ecgfrið Rex", and refers to Offa's son. He was anointed King of the Mercians in 787, nine years before his succession in 796, and would have been correctly styled rex. Stenton suggested that the name 'Biscop' came from the title 'bishop' and must post-date Paulinus's mission to Lindsey of 628 CE. But, as Sarah Foot has pointed out, Biscop does not need to have been derived from an external origin. The other genealogies in the Anglian collection close with historic personages whose dates are known, such as Edwin of Deira (616-33), Ethelred of Mercia (675-704) and Ethelbert II of Kent (725-62), but this wide range offers little help in dating Aldfrið. ^ Bede, Ecclesiastical History II.16. ^ H. R. Loyn, Anglo-Saxon England and the Norman Conquest, 2nd ed. 1991:11f, notes that praefectus is the most usual translation of gerefa, "reeve" by Anglo-Saxons writing in Latin. ^ Stenton, F. M. (1970) Preparatory to Anglo-Saxon England: The Collected Papers of Frank Merry Stenton; ed. by D. M. Stenton. Oxford: Clarendon Press, pp. 129-31. The charter is Anglo-Saxon Charter S 1183 Archive Selsey Archived 2007-07-20 at the Wayback Machine British Academy ASChart Project. Retrieved 1 March 2010. ^ Leahy, Kevin (2008). The Anglo-Saxon Kingdom of Lindsey: The Archaeology of an Anglo-Saxon Kingdom. History Press. ISBN 978-0752441115. Leahy, Kevin (2008). The Anglo-Saxon Kingdom of Lindsey: The Archaeology of an Anglo-Saxon Kingdom. History Press. ISBN 978-0752441115. Lindisware (Lindissi / Lindsey) at History Files.